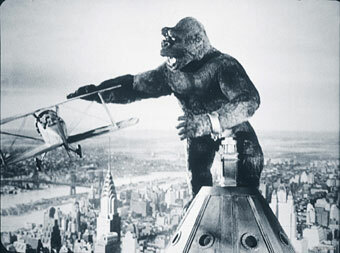 King Kong – I finally watched the classic 1933 film, and I have to wonder how much my own take on the movie reflects the creators’ intentions. I saw it as a condemnation on cruelty to animals and exploitation of them for money, with Carl Denham essentially being the villain. He uses Ann Darrow (I hadn’t previously been totally sure whether Fay Wray was the name of the actress or the character; it’s the former) as bait to capture Kong, then brings Kong back to New York, fully acknowledging that it will scare the ape. At one point, Denham criticizes a cameraman from an earlier nature film he made for not shooting footage of a charging rhinoceros, even though he had a rifle. So he was going to kill an animal that was just trying to protect itself, and could have simply been avoided? Did anyone think about it that way back in the 1930s? I’ve read that Denham’s character was inspired by Merian C. Cooper, co-director and creator of the original concept, so I don’t know that he was intended to be viewed as a bad guy. There was also a lot of misogyny, and while I don’t know that we were supposed to agree with it (the final draft of the screenplay was actually written by a woman), it was just piled on to a ridiculous degree. And why does Kong appear to have a special attachment to the first white woman he sees? The Skull Island natives speak of offering women as sacrificial Brides of Kong, but I’m not sure what Kong actually does with them. I assume he doesn’t eat them, as we see him biting people but never swallowing them. I suppose Kong would live on fruit, but the logistics of feeding an animal that big are never addressed. You would think it would be difficult even on the island, but more so when transporting him across the ocean, especially if they wanted to keep him unconscious but alive the whole time. I doubt they brought an enormous IV with them. For that matter, how would a creature of that size and shape stand upright? I’ve read enough stories with giant people and animals that I’m certainly willing to suspend disbelief, but it’s not like actual gorillas walk on their hind legs. Then again, he couldn’t very well carry Fay Wray around if he were dragging his knuckles. Kong’s size changes quite a bit throughout the movie, but I didn’t find it distracting. What struck me was how no one seemed to care all that much about the dinosaurs on Skull Island. Denham does say at one point that he wishes he could bring one of them back, but I guess he doesn’t have convenient bait like he does for Kong. I also have to mention that, while I always loved the “King Homer” segment on The Simpsons, watching the actual movie makes me appreciate just how much they referenced beyond just the main points. Not only was Homer grabbing Marge through the window pretty much a recreation of the original, but so was the scene with Lenny, Carl, and Charlie having a conversation while on the ship. So, now that I’ve seen this, are any of the remakes worth watching? I have seen that the Peter Jackson version plays up Denham’s sleaziness (well, he IS played by Jack Black), which fits with my own interpretation. Speaking of giant monsters, I haven’t seen any of the Godzilla films either, even the Americanized ones. This entry was posted in Animals, Cartoons, Monsters, Prejudice, Television, The Simpsons, VoVat Goes to the Movies and tagged apes, dinosaurs, fay wray, gorillas, king kong, merian c. cooper. Bookmark the permalink.